Today’s blog post highlights the charismatic stream, the fourth tradition in Kern Road’s Six Streams of Spirituality worship series. To date, we’ve featured the contemplative way, the holiness stream, and the incarnational tradition, with a week off from the series for a Project 606 commentary last Monday while I was out of town, missing the service which featured the social justice stream and, appropriately, the 25-year-celebration of KRMC's Ten Thousand Villages store. “What a gift the Holy Spirit is,” Pastor Janice exclaimed, recalling Jesus’ explanation to his disciples: “I have to go away, but God will be present to you through the Spirit when I am gone.” This is what the charismatic stream helps us to know…the life and truth and fruit of the Spirit, she added. The obvious strengths of the tradition, according to the Renovare site, are “an ongoing correction to our impulse to domesticate God,” a continuing challenge to spiritual growth, and “empowering for witness and service.” The stream's “perils include the danger of trivialization, when we focus on the signs and wonders rather than on the Spirit’s project; the gifts are not an end in themselves, but a means to build the kingdom,” the Renovare writings warn. 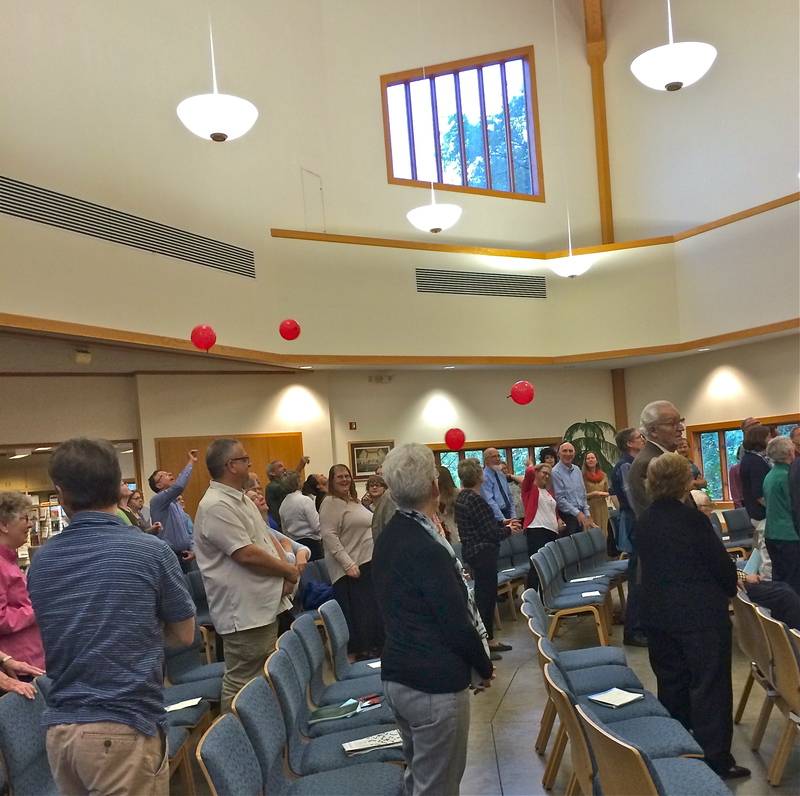 As we sang the John Michael Talbot song Let the Fire Fall for our hymn of response, Janice and a helper rained down red balloons on us, which we took turns keeping afloat as they came our way (see photo above). Andrew reminded us during sharing time following the song that it has been said that being moved to laughter and tears on the same day marks a good day; noting that he was moved to tears at memories of singing this song in his youth, Andrew added that a belly laugh followed the tears as he watched Jim kick one of the red balloons to loft it as it settled in our midst! I was curious, of course, but would not have made that request. He prayed a short paragraph of fluent syllables that I did not understand, but I intuited warmth and care and asked if he could translate what he had prayed. “No,” not really, he answered, but his assumption was that what he had voiced had something to do with gratitude for the knowledge that we are God’s beloved children. That response melted away for me a long-standing childhood prejudice. As we look at each of these six traditions individually but begin to connect the dots of our own experiences representing all of the traditions, I find articles like this one from Carl McColman intriguing. “It is perfectly possible for a devout, practicing Christian to be contemplative without any experience of charismatic gifts. And it’s just as possible to be a charismatic Christian without any sense of being called into the deep silence of contemplation,” McColman says. “But in my experience, many people drink from both wells. Maybe at different seasons of their lives, depending on their needs and the specifics of God’s call in their life. It’s also possible that a Christian enjoy both the restful silence of contemplation and the exuberant joyfulness of charismatic worship as complementary dimensions of one faith in the Triune God,” McColman concludes. As we learn more about each of these streams of faith, what mix emerges in your own experience? May we become equipped to take in both the restful silence and the exuberant joy along with bits and pieces of the other four traditions!